I was invited by SWISS to accompany their aircraft delivery team in Seattle in accepting and delivering the airline's last of ten ordered Boeing 777-300ER. In the course of this event I also enjoyed a tour of Boeing's mesmerizing Everett factory, listened to some insightful presentations on the aviation industry and visited suppliers of the 777's on-board product. Come along to get the complete picture of such a delivery process right until the landing at the plane's new homebase - also including a few last minute surprises. Read on here! At the Lauberhorn Ski Races, the striking red Tigers of the Patrouille Suisse were once again joined by a commercial aircraft of SWISS, colourful Bombardier CS300 HB-JCA. Admire their stunning joint display up in the mountains by checking out my photo feature! Join me on a sightseeing flight aboard SWISS' modern Bombardier CSeries over the Swiss Alps. And as if that wasn't enough, Fighter Jets of the Swiss Air Force are joining us enroute for an interception exercise and guide us towards Emmen Airbase for a landing. Sounds like fun, right? So give my extensive photo report a read! During recent Dubai holidays I splurged and booked a scenic flight with seaplane operator Seawings. The 40-minute tour covered all of the metropolis' major attractions and let me admire them from a truly unique vantage point. If you want to see what The Palm, The World, Dubai Marina and of course iconic Burj al Arab look like from the air, come along here! Come along as I welcome SWISS' first Bombardier CSeries aircraft upon its delivery, check out its stylish cabin during the media presentation and then hop aboard as we take the new fleet member on a scenic spin over the Swiss Alps. Read all about it here! As a reward for completing the challenging SPHAIR programme, a couple dozen students were treated to a very unique event: They were invited to follow two SWISS widebody planes to the French airport of Châteauroux, where SWISS pilots were performing their landing training. Check out my report of a day brimming with passion for aviation. Follow me on a trip in the new Swiss B777 Business Class to Montreal, where I visit Bombardier’s factory at Mirabel to check the progress of the CSeries aircraft built there. Let me take you on a tour through one of the CS100 prototypes, have a peek inside the Final Assembly Line, and come along for a spin in one of the first CSeries simulators. To top it off, the report also features some planespotting goodies from Montreal’s main airport – including some old workhorses of the North. Enjoy in German and English by clicking on the image above or here. Let me take you out to London's busy Heathrow airport on a sunny spring day, to observe all the new heavy metal that's buzzing around there! Just click here. SWISS recently added its first of nine ordered Boeing 777-300ER to the fleet. My extensive report covers the welcoming ceremony at Zurich Airport and gets you up close with the airline’s new flagship – with dozens of detailed photos from inside and out. As a bonus, I was also able to tour the striking new SWISS Lounges in Terminal E shortly before their official opening. Check out all the photos here! The annual World Economic Forum held in the mountain town of Davos always causes a seemingly endless stream of corporate and government jets approaching Zurich Airport. This year, as a welcome change, the steady influx of interesting planes was graced with an unusual amount of sunshine instead of the usual overcast clouds. Have a look at my best shots here! After having enjoyed three flights over cities inside the Edelweiss Zeppelin, it's time to join it on a joyride above the picturesque nature of the Interlaken region. Read the full report in German and English here! Join me on a very special mission: an Air 2 Air shooting with the beautiful Edelweiss Zeppelin over the city of Basel. Also included are some photos from inside the Zeppelin, taken during one of its scenic pleasure flights along the River Rhine. After its display at the Paris Airshow, Bombardier flew its fifth CSeries CS100 prototype to Zurich, where launch customer SWISS presented it to representatives of the media and politics. Get up close with the new jet by reading my coverage of the event and admire the beautiful design looking through the 70+ photos. Zeppelin over Zurich: A breath-taking experience! In celebration of its 20th anniversary, Swiss leisure airline Edelweiss Air has chartered a Zeppelin airship for pleasure flights above several regions of Switzerland. Zurich was first, and I managed to secure a seat on the very first day of operations. Read on for some of my most stunning bird's-eye views of the Lake of Zurich and Switzerland's largest city. Together with a group of friends, I chartered the Swiss workhorse of the skies for a flight, the Pilatus PC-6 porter. The one-hour trip around eastern Switzerland included some magnificent views, and a typical steep approach to finish the day. A whole lot of fun! See the spectacular photos from a joint display of a Swiss Airbus A320 and the Tigers of the Patrouille Suisse, showcasing a jaw-dropping flight display in the middle of the Swiss Alps! Read the photo feature here! 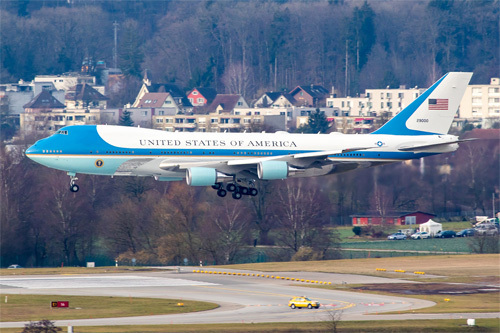 The Boeing VC-25 (747-200) 92-9000 arriving in Zurich as Air Force One, bringing President Trump to the World Economic Forum in Davos (25.01.2018). Here are the highlights of the second half of 2017. In the selection of 40 shots you find plenty of warm evening sunshine, some scenic morning approaches plus of course the odd special visitor. Enjoy! 35 photos are waiting for you, covering the first five months of 2017 at Zurich Airport. Including some beautiful snow shots, views of the snow-capped Alps or some landings in dramatic thunderstorm light. Wrapping up 2016 with 27 more photos taken in Zurich during the past three months, featuring beautiful fall colours, some rainy shots and a couple classic Russian visitors. Time for some pictures of Zurich during the summer months! Showcasing yet more 747s and those beloved action-packed summer evenings at Runway 28. Check out the shots here. Check out 25 of my best shots from the last four months, brimming with flowery spring colours and showcasing some cool visitors - like Ed Force One or B747-8 VQ-BSK. I was appointed as photographer for the Open Days of the general aviation airfield in the Zurich area. If you like seeing these Cessnas and Pipers buzzing around (I sure do! ), head here for 60 pictures. After spending the morning with my own flight training out of Basel's EuroAirport, I decided to stick around a bit in the afternoon and bag a couple beautiful highlights. Check out 13 shots here. Traditionally the winter months center around the diverse traffic of the World Economic Forum. Other ZRH attractions were SWISS' first Boeing 777, a couple large private jets (A343 and B748) plus a beautiful winter sunrise. Enjoy 50 photos here! 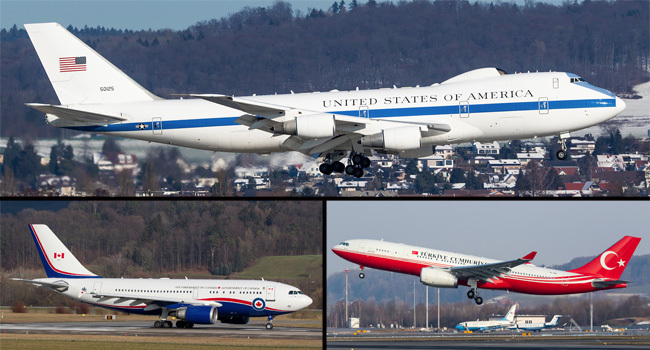 When I decided to enhance an embassy visit to Berne by inline skating around its airfield, I was in for several unexpected treats! Three C-130 Hercules of the Moroccan Air Force showed up, and in the end I was taken along on an amazing Night VFR flight. See all the photos and read the report in German or English. Transporting a large group of pilgrims, Royal Jordanian sent their brand-new Boeing 787 to Zurich. I had a chance to witness the welcome ceremony for the beautiful bird, and also have a quick peek inside the stunning, spacious cabin. Read my report, including 20 photos, in english or in german. While spending a couple nights at Montenegro's riviera, I made sure to pay Tivat's airport a few visits. Nestled between high mountains and the deep blue waters of the Adriatic sea, interesting photos are guaranteed. See 20 of them here! While I was picking up a friend at the tiny airport of Berne, I stayed for the night and captured some of the movements amidst a very rural setting. See all 16 photos in a Gallery View. A Boeing 747-400BCF of Cargolux was used to transport the Rolling Stones' stage equipment from Lisbon to Zurich. I was able to follow the unloading from up close, and peek into the cockpit and cargo hold. Find a brief report with 30 photos here.